Ford says it has an 84-day supply of its best-selling F-150 pickup. But that doesn't mean buyers won't run into shortages well before then. The automaker said Wednesday that it suspended production of the nation's best-selling vehicle after a fire at a supplier's facility caused it to run out of parts. Ford has said it doesn't know how long it will be before it can resume production of the F-150, as it scrambles to find a supplier who can provide it with the parts it needs. 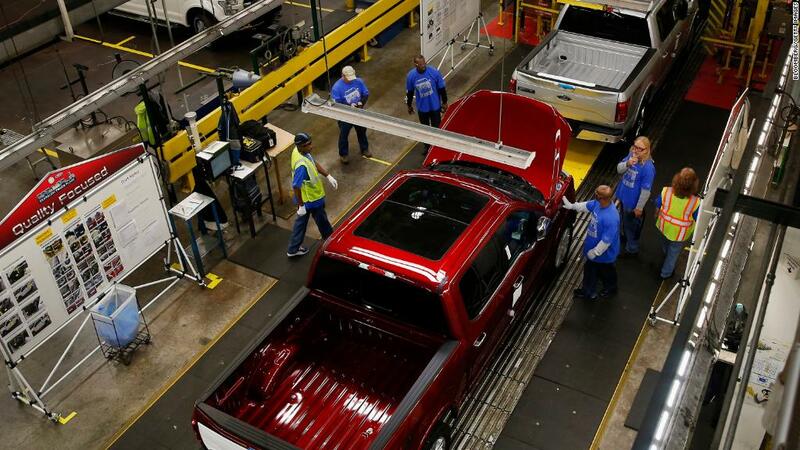 Ford has also cut back production of the larger versions of the truck, like the F-250, 350 and so on. It doesn't know how long that production problem will last either. Experts say that if Ford's two F-150 assembly lines remain shut down for more than a couple of weeks, there could start to be shortages. The F-150 can be configured in many different ways, said Michelle Krebs, AutoTrader senior analyst. "There's a lot of different engines, different cabs, different cargo beds," she said. As a result, some buyers might have trouble finding the specific vehicle they want if the shutdown continues for more than a couple of weeks, Krebs said, even if there are plenty of other F-150's on their local dealer's lots. "Dealers want to have a larger inventory on the lot that appeals to all the different truck buyers," she said. "They won't be able to do that if this goes on for more than a couple of weeks." The F-series pickups have been the best selling vehicle in America for more than 30 years, and account for roughly a third of Ford's US sales. There are several other factors that could boost demand for the F-150 right now. First, rising gas prices are rising, and the newest F-150, which uses light-weight aluminum, gets about 22 miles per gallon, according to EPA estimates. That compares to only 13 miles per gallon for a 2012 model. Older models typically are even bigger gas guzzlers. Rising interest rates could also bring people into showrooms sooner rather than later, Krebs said. And there's a chance that the headlines about the production shutdown could prompt some buyers who were thinking about buying a truck later to buy one now. Any F-150 shortage could also mean higher prices, since dealers will be reluctant to price their remaining inventory aggressively. "There's been some good incentives on pickups," said Krebs. "The deals going forward will not be as fabulous."